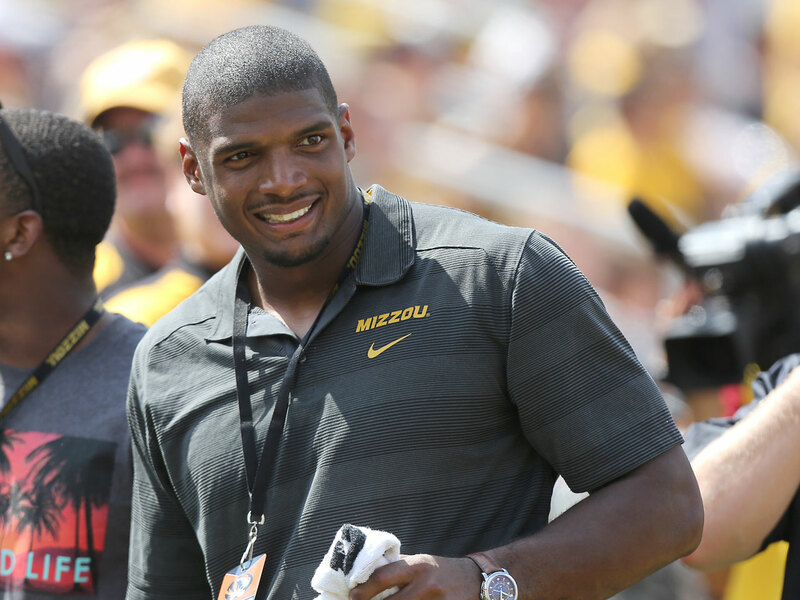 The Dallas Cowboys have signed Michael Sam, the first openly gay player drafted by an NFL team, to their practice squad, head coach Jason Garrett announced Wednesday. The seventh-round pick cleared waivers over the weekend and was free to sign with any team. The St. Louis Rams released Sam on Saturday and filled their 10 practice squad slots Monday, leaving off the SEC's co-defensive player of the year. Sam had three sacks during the preseason, but hadn't found any takers in the NFL until the Cowboys called. "We got nothing but good reports about him from people in St. Louis," Garrett said at a press conference announcing the signing. "We just want to give him a chance to come in and see if he can help our football team." Sam isn't likely to be on the active roster for Sunday's opener against San Francisco. Garrett said the move was "about football" and deflected any questions about the impact of bringing in Sam or how it might affect the locker room. "That's your decision what question you want to ask," Garrett told a larger-than-usual crowd at his daily news conference. "We're focused on football. That's where our attention is, and what people say outside this organization is really up to them." The Rams selected Sam, who had a stand-out career at Missouri in college, with the 249th overall pick out of 256 overall. He kissed his boyfriend as a national television audience looked on, and arrived brimming with confidence and with a quick retort for anyone who contended he was in the NFL only because he came out. Rams head coach Jeff Fisher had said he was proud to have made the landmark pick, but he made clear from the start that he chose Sam because he thought he had the talent to make it. Garrett was careful to say Wednesday that Sam is not guaranteed to play a down in an actual game for the Cowboys, pointing out that his team had made a handful of signings in the preseason along the defensive line that are going to already be on the 53-man roster. Sam is expected to help the team prepare for opponents as a member of the practice squad, Garrett said. Each NFL team is allowed a 10-man practice squad in addition to the regular 53-man roster that suits up for games. It is not unusual but somewhat rare for a practice squad player to make the switch to the 53-man roster, and that usually occurs when injuries take down regular starters. Any team can sign Sam off the Cowboys' practice squad, but would have to put him on the 53-man roster for a minimum of four weeks. Being on the Dallas roster means Sam is returning to his home state. He was a lightly regarded recruit out of Hitchcock, Texas, a town of about 7,000 along the Gulf Coast about 40 miles southeast of Houston. His first two years at Missouri, Sam backed up Aldon Smith and Jacquies Smith, both of whom are in the NFL. The Cowboys didn't have Sam on their draft board, with owner Jerry Jones saying his size and skill set had him caught between defensive end and outside linebacker. Dallas passed on him with three of five seventh-round picks before the Rams got him. But Dallas heads into the opener with serious questions about its defensive line after giving up the most yards in the NFL last year - and third-most in league history. Defensive end George Selvie, who might miss the opener with a shoulder injury, is the only Dallas lineman who had more than two sacks last year. Tackle Terrell McClain, one of the key free agent signings, is likely out with a sprained ankle. The other major free agent pickup, tackle Henry Melton, missed all the preseason games with a groin injury. He hasn't played since tearing a knee ligament with Chicago in Week 3 last year. Rookie DeMarcus Lawrence, who was drafted in the second round with the hope that he could at least partially fill Ware's void, can't play until after the eighth game. He's on short-term injured reserve with a broken right foot. Sam, who won the SEC defensive player of the year award with 11.5 sacks at Missouri last season, couldn't crack a St. Louis roster that was stocked with proven pass rushers. But he also lost out to Ethan Westbrooks, the Rams' top target among undrafted rookies.